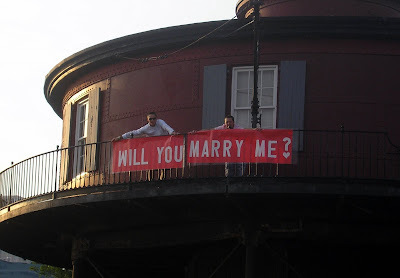 With all of the recent "Will You Marry Me" that's been going on around these parts lately, thoughts of my own engagement story have been flooding my memory! It's been over three years since he asked those fateful words and I got to thinking. Maybe it's time I share our story. 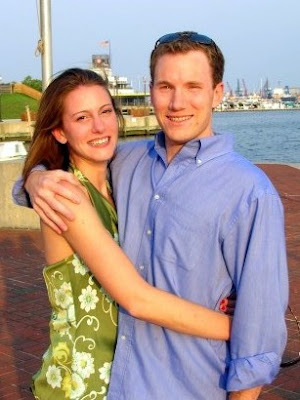 Our Love Story begins in 2003, on the campus of Villanova University. I was an innocent sophomore nursing major and my future husband a big, bad junior in one of the University's coolest fraternities. Let's just say that the fraternity to which my future husband belonged was infamous for their parties held at the "Tiki Hut" (the name given to the apartment where Mike lived his Junior year, complete with a Tiki Bar, grass skirts and 24/7Jimmy Buffet playing on the stereo) and being the social butterfly that I was, my girlfriends and I loved going to the boys' apartment to pregame before a regular night out on the town. I hate to say that we met over a game of beer pong- but such was the beginning of a whirlwind romance. I immediately fell in love with his sparkling blue eyes and curly blonde hair tucked beneath a backwards O's. And so began our college romance. We were so enamored with each other, we didn't mind the freezing cold walks to and from each other's dorm room at night. Of course, my darling future husband did most of the walking! He let me stick post-it notes to various muscles and bones of his body when my anatomy class required that I become familiar with each and every one of them. He asked me to be his girlfriend on January 23rd, 2003 because he "couldn't wait all the way until Valentine's Day." He made me laugh. A lot. All the time. Just like my Dad. We dated throughout our remaining years at Villanova. Falling even deeper and more madly in love. When it came time to break out into the Real World, he chose a job nearby so that he would be around as I finished up my last year at Villanova. He's been a part of every single important college memory I can recall. And every single important memory since then. Fast forward to July 1st, 2006. A little over one year after I graduated college. Avid fans of fine wine and dining, Mike and I were always going out to nice dinners- so a Saturday night dinner date at La Scala in Baltimore was anything but out of the ordinary. I was so excited to be down in the Inner Harbor- Afterall, I hadn't been down since my first trip there over two years ago. I couldn't wait to see my favorite lighthouse, the Seven Knolls lighthouse that stands at the end of Pier 7. As it turned out, dinner was delicious (a certain recommendation for anyone who loves Italian!) Think: Incredibly romantic. Dimly lit with no more than 15 tables. Great wine, melt-in-your-mouth lobster and of course, good company. Before we knew it, it was 7:15 and Mike and I were due to meet our friends at one of the local bars. Knowing how much I wanted to see the lighthouse, Mike promised we could quickly stop on by it on our short walk across the pier. As we neared the lighthouse I noticed a little sign along a gated chain that read, "Lighthouse closed for Renovations. Will Re-Open Soon!" As I began to pout, Mike suggested that we walk to the edge of the water to take pictures. Clueless, I followed. As I bent over to take my camera out of my bag I fail to notice Mike getting down on one knee..and...pulling out... a ring box.. "Look up towards the lighthouse..."
Shaking and with tears of absolute happiness, I pulled him up from his knees and said, "YES!" to the most amazing man I had ever met.. my future husband. And if you didn't think it could get any better.. As soon as I screamed YES! I heard cheering and clapping.. Not only were the passing ships privy to our special moment, but so were 20 of our closest family and friends! Having them there made the whole event all the more special..
What's an engagement without a celebration? Probably one of the most memorable nights of my life concluded with food and drinks at a local Pub with everyone who was there to witness the special occasion. The following night, I was surprised, again, with a hotel room in DC and the best lawnseats seats for the Capitol's 4th of July Fireworks show. It's been three years since he proposed and I love him more than I did the first night I met him, more than that night he proposed, more than that crisp October Saturday when I said, "I Do!" and even more today than I thought I could ever love him! awww what a sweet story:) your guy is sure a romantic and thoughtful one! This is still one of the cutest engagement stories ever! aww that's a great story! what a perfect engagement story!!! he did good! What a great story! I have goosebumps! Great story! I wish I had a pic of my hubby on his knees when he proposed. 1. you look SO young!! What a sweet proposal! I love hearing couple's stories! Love this! I totally got teary eyed reading this! that is an absolutely beautiful proposal!!!!! What a lucky girl you are!!!! What a sweet story! I love it. such a sweet story. I would give anything to have a picture of my husband on bended knee. So special! PS - Also love that halter! 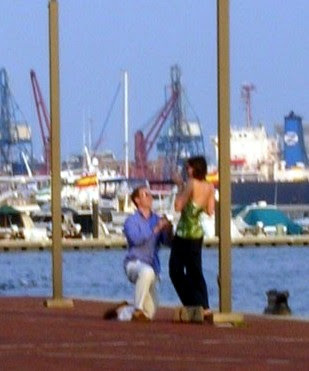 What a sweet proposal story!! This post made me happy. Thank you for sharing such a wonderful story. awww! sorry this comment is so late, but that is SO SWEET! i love it.